I wasn't sure what I was expecting going in, but I ended up with This is Where I Leave You by Jonathan Tropper on steroids! 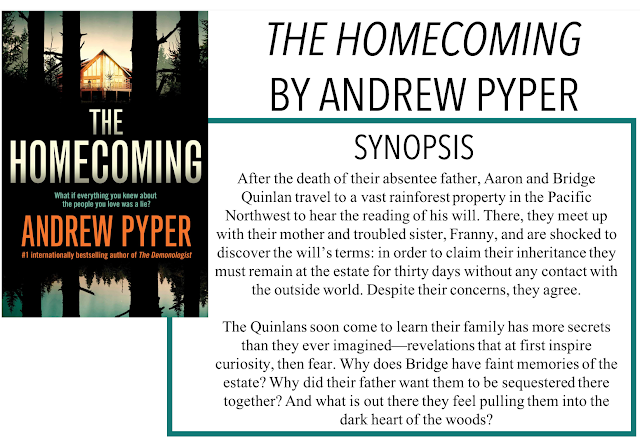 I am back with another review, The Homecoming by Andrew Pyper. Thanks so much to Simon and Schuster Canada for sending me a copy of this book as part of the Thriller Chronicles program, as always, all opinions are my own. This story follows a family after their absentee father's death. As part of the will reading, Aaron, Bridge, Franny and their mother, Eleanor, are required to travel to a remote rainforest in the Pacific Northwest - 600 acres of which belonged to their late father. His last request, in order for everyone to receive their portion, is to stay on the property for 30 days. With lives of their own, most of the family fight this ruling, but ultimately, none is brave enough to test what would happen if they left and fought in court. As the days go by, secrets about their father come to light and as things turn deadly, they begin to wonder if that was what their father wanted all along. Writing-wise, I think this book was fairly well done. I was engrossed in the story and despite being quite freaked out in some parts, continued to read, finishing this book before bed (a bit of a mistake, if you ask me! Let's just say I didn't sleep great). The plot was well done - there were a number of twists, none of which I saw coming. I thought they were well thought out and planned in such a way that made them a surprise but, at the same time, a believable part of the plot. I would definitely suggest going into this one blind - I certainly did and it was better that way, I think. I would say this is on the fence between horror and thriller. It was definitely scary enough to be considered horror - and I like to think I don't scare easy in books - but the scary parts were explained in the end, which made them less scary. I'm sure that's not the typical definition of horror but that's what I'm going with. Overall, a unique and interesting read!